Instant Pot Balsamic Pot Roast is the perfect last minute easy meal the whole family will love. 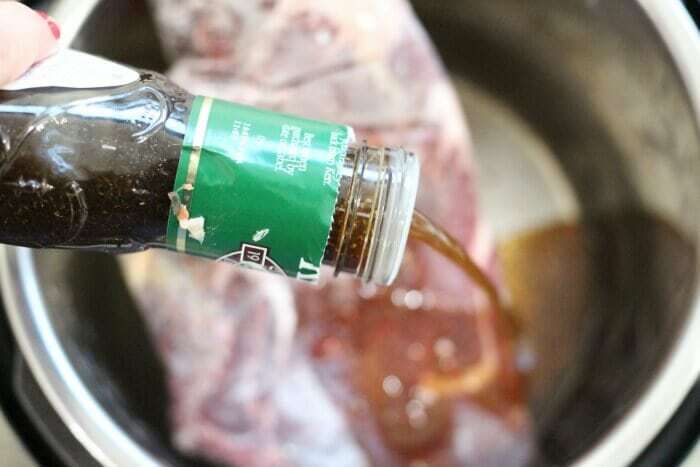 Only two ingredients to make a delicious tender and flavorful balsamic roast. You guys. I had no intention of posting this Instant Pot Balsamic Pot Roast recipe today. Or ever. In fact, until 5:30 last night, there wasn’t even a flitter of this pot roast recipe in my brain. Last night I was in a little bit of a ‘woe is me’ state. Things beyond my control had caused the day to be super busy, but entirely unproductive. At 5:15 my kids started hollering about dinner, and I near panicked. We had leftovers in the fridge, but that’s what they had for lunch. (And dinner the night before if we’re being completely honest). I knew there was no way it would fly again and the thought of listening to five kids whine about dinner made me want to run away from home. I popped out to our deep freezer and sitting at the top was a three pound beef chuck roast from our last Moink box. It was frozen solid. Like, granite solid. Not ice cream solid. Like, would probably shatter into a million pieces if i dropped it solid. Pure. Ice. I pulled the roast out and went foraging in our pantry where I found a bottle of balsamic vinaigrette dressing and a handful of sweet potatoes. I could have made my own balsamic dressing (and would have had the bottle not been sitting there), but honesty I was glad to just get it in and going quickly! Let’s be real. I had no idea if I could instant pot a frozen pot roast, let alone in time to get it on the table for dinner. But, I was desperate. And the only reason you’re getting pictures is because my camera happened to be sitting on the counter from an earlier project. So, why not? I threw a few handfuls of quartered sweet potatoes in with our balsamic pot roast because it’s what we had on hand, but you could skip that completely. Or! You could add lots of other delicious veggies, like carrots, onions, celery, parsnips, and on and on. It’s important to remember though, that the more volume you at to your instant pot, the longer it will take to come to pressure. If you’re making this balsamic pot roast recipe with a thawed piece of meat, I strongly suggest turning the saute option on and searing the sides with a little bit of oil first. It will add more flavor. That said, ours was a popsicle when it went in, and it came out absolutely delicious without having been seared. At 5:15p I had no idea what we would be eating for dinner. At 5:30, I piled frozen food into the pressure cooker. And at 7:15 we were sitting at the table eating a super yummy balsamic pot roast with a side of roasted cauliflower. 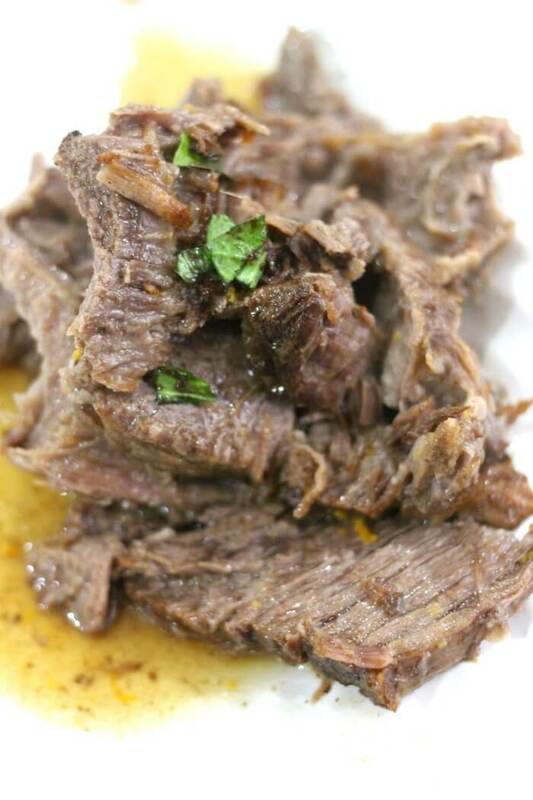 WHAT’S THE BEST MEAT FOR BALSAMIC POT ROAST? My feeling is, the best meat is the one you have on hand. 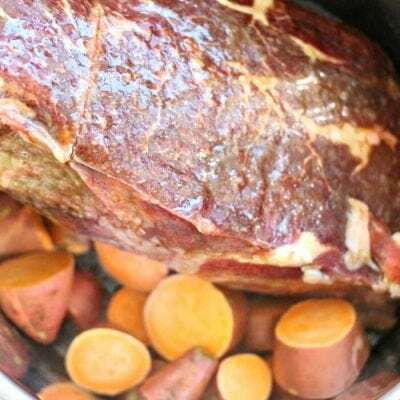 For this balsamic pot roast recipe we used a beef chuck roast. 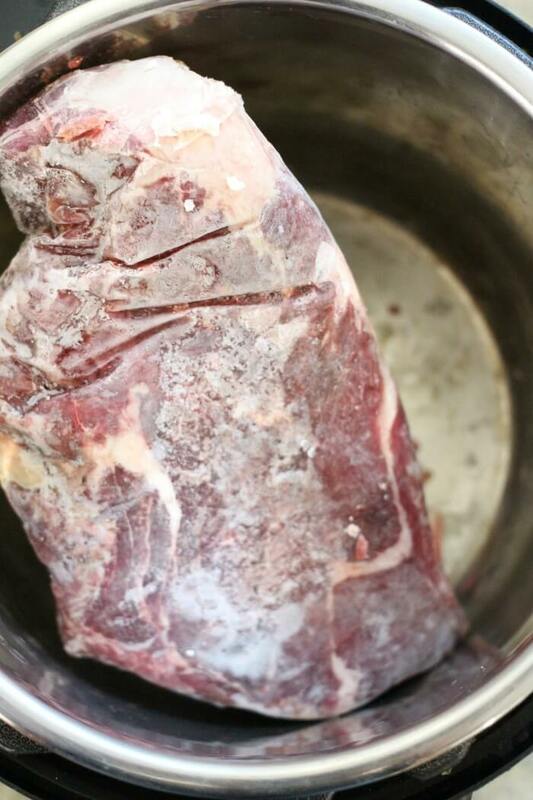 The great thing about pot roast, especially ones made in the instant pot pressure cooker, is that they will be super tender no matter what cut of meat you start with. So, don’t be afraid of using an inexpensive cut of meat for this recipe. HOW DO YOU COOK A BALSAMIC POT ROAST? I am absolutely loving the instant pot method for pot roast. 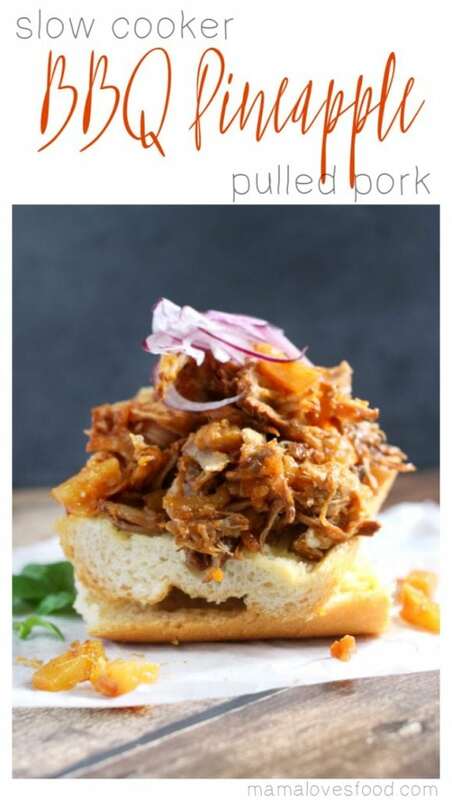 It’s so efficient and comes out tender and juicy in a fraction of the time compared to oven or slow cooker recipes. WHEN SHOULD I ADD POTATOES TO POT ROAST? This is a tougher question – if you don’t mind your potatoes being very (very, very) soft, then you can throw them in at the beginning of the cook time when you start the meat. It’s what I usually do because when I’m using my pressure cooker, I’m doing so because I want a no muss no fuss recipe. The potatoes will come out very soft, but not overcooked and still very tasty. Which is a-okay with me. That said, if you want your potatoes to be more firm, you could reduce your pressure cook time on the roast by 5 minutes, and add them in, then continue to pressure cook an additional 5 minutes. How long do you cook a roast in an electric pressure cooker? We cooked our frozen solid 3 pound block of ice roast on manual for 60 minutes. It took about 15 minutes to come to pressure. And it was perfect. If your roast is thawed, you can shave about 15 minutes off that time, and if it’s both thawed and browned, you can shave closer to 20 minutes off the total cook time. 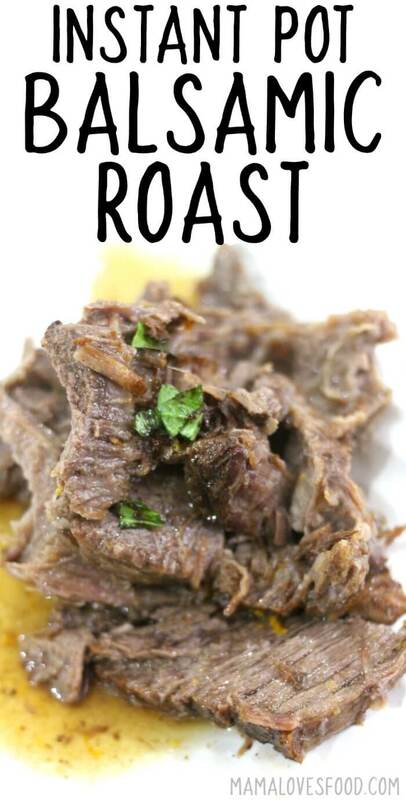 If you’re loving this Instant Pot Balsamic Pot Roast Recipe, make sure to check out these other fantastic beef recipes! Classic Pot Roast – Made the traditional way, with the traditional flavors, if our balsamic pot roast wasn’t enough for you, this classic pot roast recipe is a great next step! Slow Cooker Italian Shredded Beef – One of hubby’s favorites. Make this Italian Shredded beef in the slow cooker, then serve it on toasted rolls with provolone cheese. Oh, em, gee. Bourbon Bacon Roast Beef Sliders – It’s cool if you don’t want these, I’ll just eat them all myself. It’s basically everything I love in life put into a sandwich. Mmmmm. Hoisin Beef Noodle Stir Fry – For when you don’t just want beef, but Asian beef. Let’s talk about the fact that hoisin is a majorly underused flavor. So good! Crock Pot Beef and Vegetable Soup – Absolutely hands down one of my very favorite comfort foods. 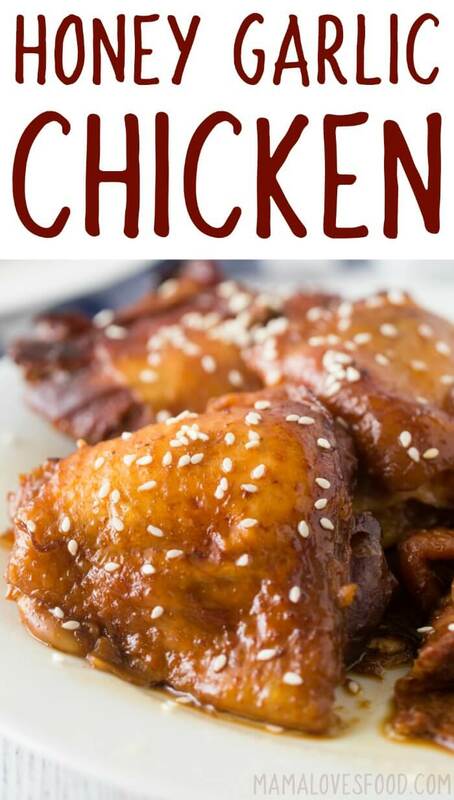 You can make this in the instant pot too with just a few easy modifications. Watch us make it here! Chimichurri Grilled Skirt Steak – I love all the things about this recipe. But especially the sauce. Ohhhhh, the sauce. I put it on everything from steak, to burgers, and even salads. Add some mayo and make it a creamy chimichurri sauce too! You won’t hate me for it. 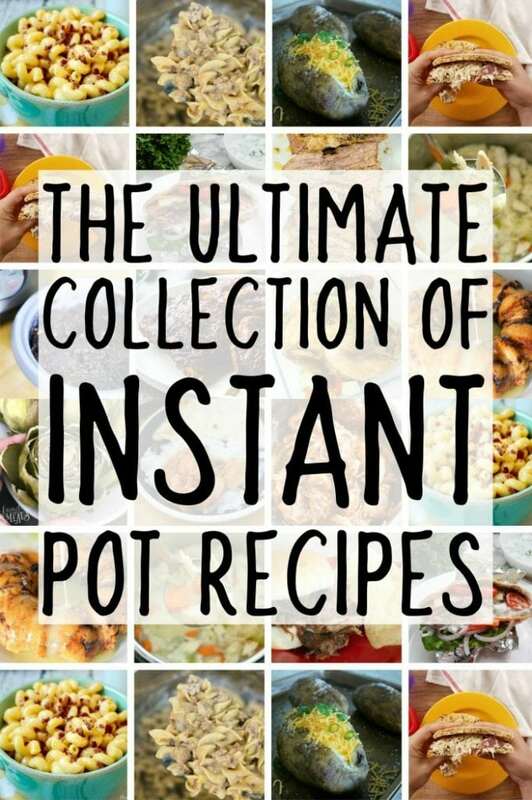 Check out our Amazon affiliate links for these great instant pot recipe must-haves! 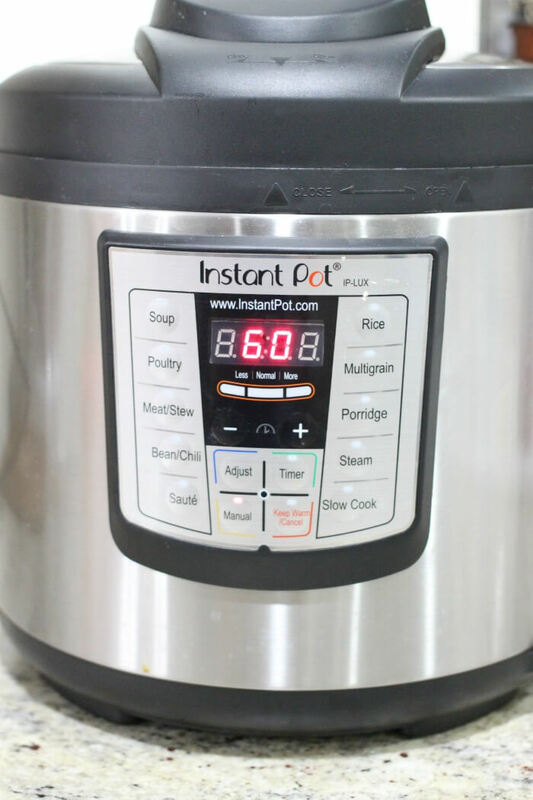 6-in-1 Instant Pot Electric Pressure Cooker – This is the exact Instant Pot used for this recipe and also seen frequently on my show. Extra Sealing Rings – The sealing rings will start to get stinky after a while. If that doesn’t bother you, then no worries! A lot of folks like to use different rings for different things – like all the desserts are made with one ring, and all the curries with another. Stainless Steel Spider Strainer – I love this strainer for pulling out larger chunks of vegetables and meat, or for grabbing hard boiled eggs. It’s just an all around good strainer, whether used with the instant pot or not! Stainless Steel Steamer Basket – An absolute must have for steaming veggies or making a big batch of hard boiled eggs. We use ours all the time and you can see it in action here. Instant Pot Tempered Glass Lid – This is great for when you’re using your pressure cooker on the slow cooker function. I don’t know about you, but I like to be able to see what’s going on inside. 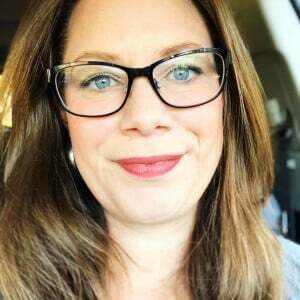 Stainless Steel Inner Cooking Pot – I like to do several recipes in a row in my instant pot and I don’t always want to stop in between to wash the inner pot. It’s great to have a second one on hand! If your roast is thawed and you would like to sear it before pressure cooking, turn the instant pot to 'saute', and sear sides with a small amount of oil. Add roast to pressure cooker and pour balsamic dressing on all sides. If you're adding vegetables, place them under the roast. If the roast is frozen, set the instant pot to manual 60 minutes. If it is thawed, but not seared do manual/45 minutes, if it's seared use manual/40 minutes. When the time is finished, carefully do a quick pressure release and check to see if it's done. If the meat is not tender to your liking, turn it back on manual in five - ten minute increments. The pot should re-pressurize quickly since it's already super hot. If you would like to thicken the drippings for a gravy, create a slurry with cornstarch and a small amount of the roasting liquid, then pour it back in the pot and mix well. If your roast is thawed and you would like to sear it before pressure cooking, turn the instant pot to ‘saute’, and sear sides with a small amount of oil. Add roast to pressure cooker and pour balsamic dressing on all sides. If you’re adding vegetables, place them under the roast. If the roast is frozen, set the instant pot to manual 60 minutes. If it is thawed, but not seared do manual/45 minutes, if it’s seared use manual/40 minutes. When the time is finished, carefully do a quick pressure release and check to see if it’s done. If the meat is not tender to your liking, turn it back on manual in five – ten minute increments. The pot should re-pressurize quickly since it’s already super hot. I love balsamic, so I know I’m going to love this recipe, can’t wait to try it! I love that you tossed in a frozen hunk of meat and had a delicious dinner so quickly. After working in the yard all day and realizing I had nothing thawed, I thought I’d see if what everyone says about Instant Pots working magic with frozen meats is true. 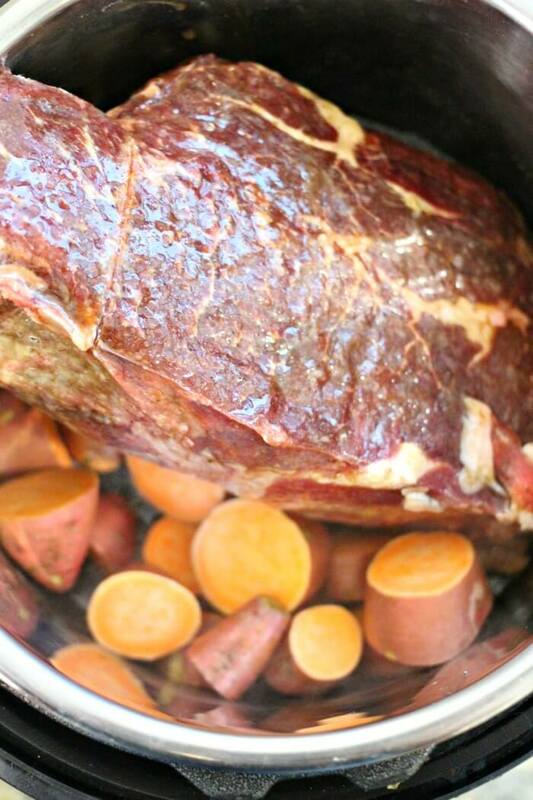 Googled “Instant Pot Frozen Roast” and found your perfect recipe! Simple was exactly what I needed and you can’t get any more simple than this. My family loved it, and I loved that I had a hearty meal prepared for them in 90 minutes. wonderful! 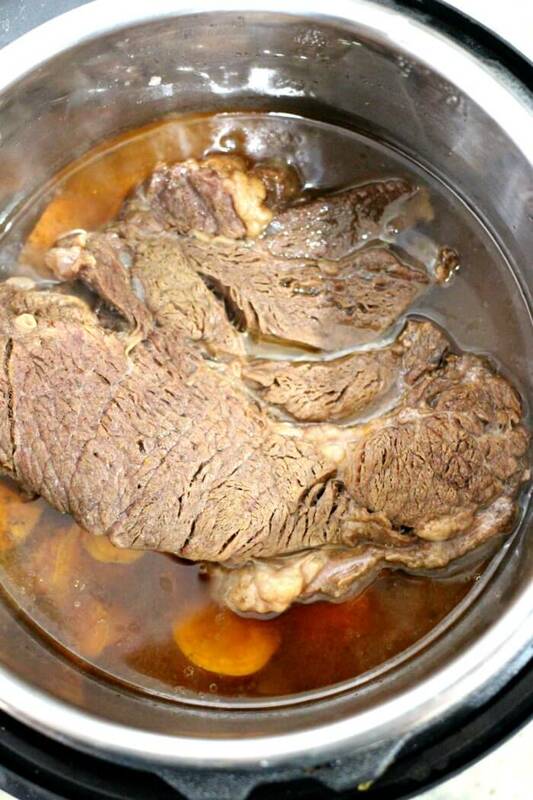 i’m so glad you enjoyed our balsamic pot roast in the instant pot!!! I noticed you only put “1 bottle balsamic vinaigrette dressing” in the ingredients. Did you use a certain amount, or add the entire bottle of vinaigrette in? This was ridiculously easy and by far one of my favorites from my Instapot. Thanks so much for posting! What size bottle of dressing are you adding to this recipe? ?